Every runner knows why it is important to include strength training in their workout routine. It not only trains your muscles to help you have a higher endurance but also help prevent injuries. One of the recommended strength training exercises is sit ups. In this article, we will discuss the benefits of sit ups and how you can incorporate this natural yet effective technique in your own routine. 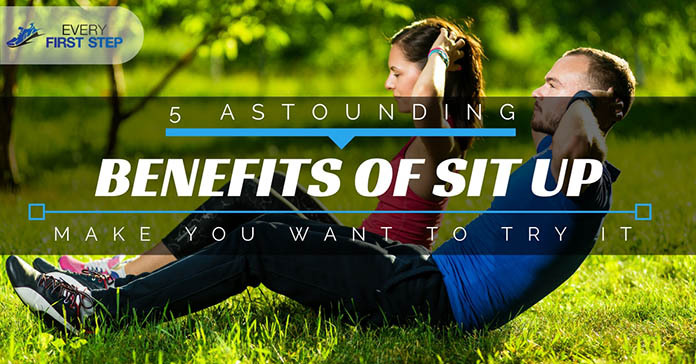 One of the less common benefits of doing sit ups is that they help strengthen your spine. Having a stable spine will reduce the chances of you getting injured. A healthy spine also increases your flexibility and range of motion. With such ability, you will be able to endure whatever terrain you choose to run on. Having a stable spine also helps you achieve good posture. As a runner, being able to maintain a good form is critical to improving your performance as an athlete. Doing sit ups is an easy way to develop and keep good posture. Doing sit ups involve a greater range of movement and a lifting motion. This means more group of muscles are used and more calories are burned. Unlike other strength exercises that only focus on your core, sit ups also train your other muscles including your hips and legs and even your chest. Compared with the standard crunches, sit ups also burn more calories. Having a lean build is a significant advantage for any runner. Focusing on simply running is not enough to fulfill your body’s needs. On the other hand, as a runner, you may not always feel like engaging in other physical activities. Sit ups do not require any special skill and yet provides a full body workout. Doing sit ups before a run warms you up and gives you the energy you need to complete your run. ​The problem with other strength exercises is that making them more intense is a big challenge. In contrast, sit ups can be easily modified to give you a bigger challenge. Being able always to make your workout more challenging will keep your body fit. Keeping your body on its toes by intensifying your workout ensures that you don’t reach a fitness plateau. This is the stage wherein your body isn’t challenged and you stop making progress. Doing sit ups makes it easy for you to add a little intensity, so your body doesn’t get bored. Wherever you find yourself, you can do sit ups. For this reason, sit ups can be considered a unique. You can do them before, during or even after your workout. No matter where your running takes you, sit ups are one of the simple workouts that you can do without any equipment. You can thereby save time going to the gym and help you focus on your workout. As a runner, you probably love the outdoors and gym may not seem appealing. For this reason, many runners forego strength exercises but sit ups can be done wherever you are. This will ensure that you never go for a run without doing a full body workout. ​The core muscles include your lower back, hips, abdomen and pelvis. Having weak core muscles can hinder movement in your arms and legs. Also, your flexibility can be affected causing you to get injured doing basic activities at home. Back pain is another negative effect of having a weak core. Doing sit ups helps train the core muscles so that you don’t easily get back pains. ​In order to make sure you get the best result from your sit up routine, it is important that you have the proper form. Here are some tips to help you do a proper sit up. For many, doing sit ups becomes a tiring routine for the reason that they are doing it with the wrong form. To prevent yourself from suffering the effects of a wrongly positioned sit up, avoid these pitfalls. Instead of slowly controlling the sit up, many opt for rapid movements in an attempt to create momentum. The problem with fast sit ups that they give you less efficient since involving less muscle. This is another mistake that is common and can result in experiencing back problems. Always keep your feet planted firmly on the ground. Using A Spotter To Hold Your Feet. Many use this as a way to ensure that their feet are planted firmly on the ground. However, doing this removes the chance of working out the stomach muscle called abdominals. It also stresses the lower back muscles excessively. Many concentrates on the number of sit ups they do instead of the quality and proper form of their sit ups. Instead of numbers, try and focus on doing even a few sit ups but using the proper form and posture. Many believe that sit ups are mainly for achieving six pack abs. The truth is sit ups can be an excellent whole body workout if you include them in your workout routine. The Crunch. Instead of sitting to reach your thighs, you stop halfway and go back to the original position. Reverse Crunch. Instead of using your upper body to sit up, use your legs to move towards your upper body. Side Crunch. Instead of planting your feet on the ground, you keep your legs on the side and then move your upper body towards them. Wide Leg Sit Up. Lie with your knees opened wide and feet touching each other and then perform the sit up keeping your arms forward. Scissor Kick Crunch. Lying on your back, move your legs like scissors without letting them touch the ground. Other variations you can try that are more advance include the reverse crunch, Russian twist, dragon sit up, running man sit up, bicycle crunch and frog crunch. Including sit ups in your running routine is one of the best ways to train your core muscles and strengthen your spine. In addition, it is easy to perform and has so many variations to help you increase the intensity of your workout. When doing sit-ups, make sure you follow proper form, so you avoid getting back pains and not getting the most out of your workout. Focus on doing quality sit ups and always add a new challenge by varying the type of sit ups you do. How did you enjoy this article? Do you include sit ups in your workout routine? Which is your favorite sit ups and how often do you do it? We’d love to hear your thoughts in the comments below. Please also remember to share this article with other runners.